It is time to demand real—Rooseveltian—leadership from our elected officials on climate and equity issues. But policy gridlock runs deep. As the Sunrise Movement points out, either politicians advance policies without mobilizing their base for support, or social movements mobilize without elected officials to turn demands into policy. Social movements have an opportunity to join together as never before—not just to get behind the Green New Deal—but to form a broad-based, multi-racial, working class movement to build political power. Why food and farming? First, because the industrial food system emits most of the planet’s greenhouse gasses, and farming is reeling under the impacts of climate change. Second, because food and farming are the nation’s biggest, low-wage employers. And third, because the farm and food justice movement—spread wide and thin across both rural and urban landscapes—is fighting not just poverty, poor health, low wages and bad working conditions, but is seeking to reduce food’s environmental footprint as well. To stop the industrial overproduction of food—the root cause of food waste and agricultural emissions—we need strong supply management programs, equitable land access, conservation programs, diversification of farm income, antitrust enforcement, and market reforms. If farmers are also provided with a guaranteed farm parity price for their product, they can conserve land instead of overproducing. If farm and food justice demands are articulated in the Green New Deal, it could help us transform our food system. 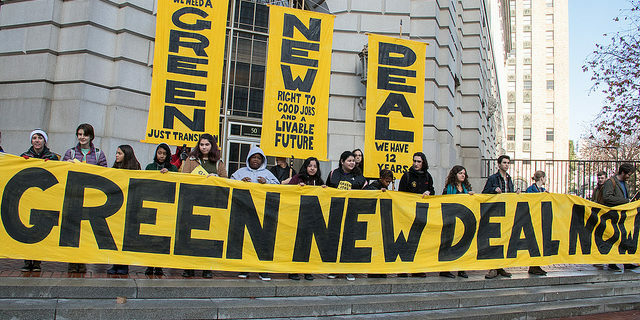 Social movements have an opportunity to join together as never before—not just to get behind the Green New Deal—but to form a broad-based, multi-racial, working class movement to build political power. Visionary leaders from these movements are already knitting together strategies for solidarity, education and action. This is essential because without strong grassroots involvement, a Green New Deal could be co-opted by industry to greenwash their operations and avoid a just transition. For example, government grants and tax breaks could go to giant CAFOs to build methane digesters for the livestock industry’s vast manure ponds. We need to prevent disaster capitalism—profiteering on working people’s climate misery—in which every crisis is an opportunity for amassing more corporate wealth. We need jobs with living wages to build family and community wealth. Food-producing communities need to be desirable places to live where the health, education and welfare of everyone is guaranteed. If we are to “[Decarbonize, repair and improve] transportation and other infrastructure” in the food system, we need to keep as much of the food dollar as possible in local communities by growing and consuming our food in close proximity. The photosynthesizing power of green plants and the carbon-storing capabilities of soil humus could be vastly increased through the Green New Deal’s “Funding [of] massive investment in the drawdown and capture of greenhouse gases,” allowing for the reforestation of riparian areas, woodlots, and agroforestry plots, and even small-scale kelp farming. Changing everything in order to change our food system seems like an impossibly big task. But the food system can also be a lever for whole systems change. These measures need to be part of our social justice platforms to address the inequitable levels of climate and environmental vulnerability. We need jobs with living wages to build family and community wealth. Food-producing communities need to be desirable places to live where the health, education and welfare of everyone is guaranteed. This will encourage young people to build on family and social networks and become active political and economic citizens who can determine their own destiny. A Green New Deal could also help bring the food movement out of its political silo. Many food activists seem to operate under the assumption that we can somehow change the food system in isolation from the larger political-economic system in which it is embedded. Changing everything in order to change our food system seems like an impossibly big task. But the food system can also be a lever for whole systems change. The Green New Deal just might be the fulcrum upon which the farm, food and climate movements can pivot our society towards the just transition we all urgently need and desire. Thank you to Patti Naylor, George Naylor, Elizabeth Henderson, Devon Peña, Lisa Griffith and Marilyn Borchardt for their comments and observations on this article. Cover photograph by Peg Hunter.